Martha Stewart's new line of housewares has hit the shelves at Macy's department stores across the United States. Preliminary reviews are excellent! Custom-designed display cases showcase a variety of beautiful towels, bed linens, cooking and baking supplies, dishware and furniture in small 'boutiques' inside the Macy's stores. The 'Martha Stewart Collection' is available exclusively at Macy's and is a more upscale line than the 'Everyday' collection of similarly branded goods available at Kmart stores. The quality of the Martha Stewart Collection is of a higher standard and the cost, therefore, is also higher but is still reasonably priced. Below are some examples of some of the products that have caught my eye. You can view the complete line by visiting macys.com and doing a search for "Martha" in the space provided. I need this red apron! And that blue tea kettle is just... Well, I want it. 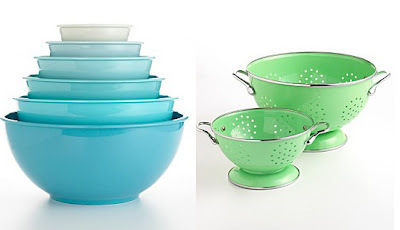 A melamine bowl set and a shocking green collander set. I love the vivid colors of this collection. 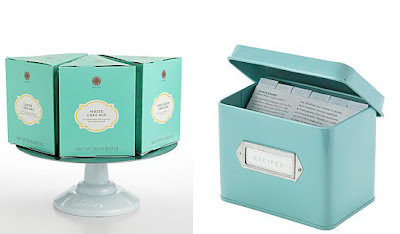 Boxes of cake mixes and a sleek recipe box. 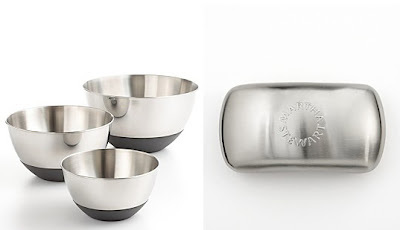 A non-slide stainless steel mixing bowl set and a 'scent neutralizer bar' for use after chopping onions or garlic. 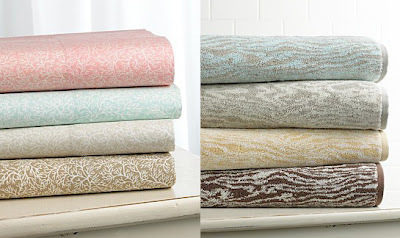 Coral spray cotton percale sheets and faux-boix patterned towel sets. I have seen them in Macys they are beautiful!! I wish I could still purchase the Faux Bois towels in her collection at Macy's. Martha, please bring them back!